Martina McBride’s new cookbook Around the Table: Recipes and Inspirations for Gatherings Throughout the Year is filled with entertaining menus and ideas for every occasion. In it, she says “If I weren’t a performer, I think I would love to be a party planner. Every aspect of planning a gathering – coming up with the party theme, designing a unique invitation, creating a menu, and setting the scene – speaks to my creative side.” With menu themes such as A Bountiful Tuscan Feast and Family Pizza Night to Red Wine and Vinyl to a Taco Fiesta, each with a suggested musical playlist, there’s a little something for everyone in this lovely book. Not surprisingly, her family celebrates Christmas much in the same way that mine does, cutting down a tree and decorating with boxes of ornaments, each with stories and memories attached. We would watch Christmas movies or listen to Christmas music and enjoy mugs of hot cocoa or spiced apple cider and plates of fresh baked cookies. 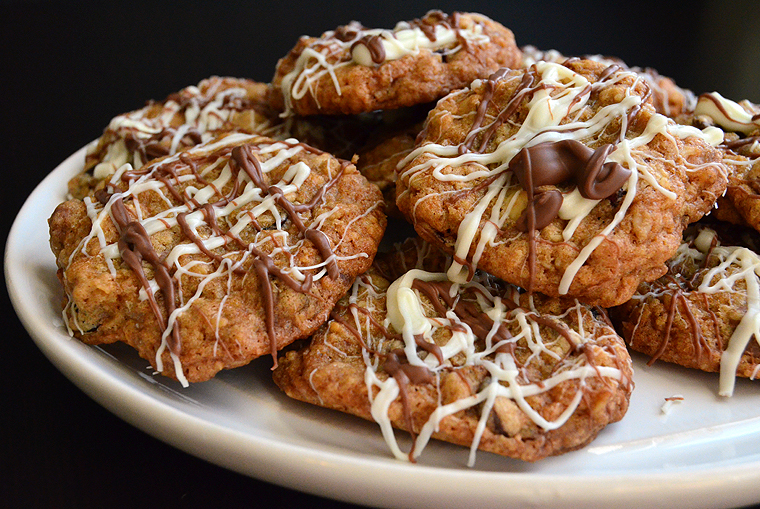 The Christmas season upon us and it’ll soon be time to set out a plate of cookies for Santa, and I thought it would be great time to feature a couple of her delicious recipes that the kids can even help make. When I was little I remember decorating Christmas cookies with my family, each of us kids trying to make the perfect cookie for Santa. As Martina said “We all hang on to things from childhood, and food memories, especially, become so much a part of who we are.” I couldn’t agree more. 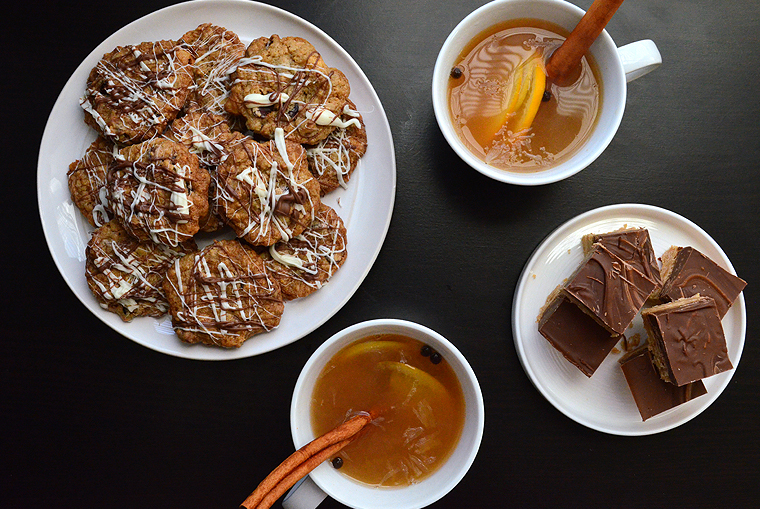 For Santa this year I chose triple chocolate cranberry oatmeal cookies, peanut butter incredibles, and a wonderful old-fashioned mulled cider that can be enjoyed by kids as well as grownups. 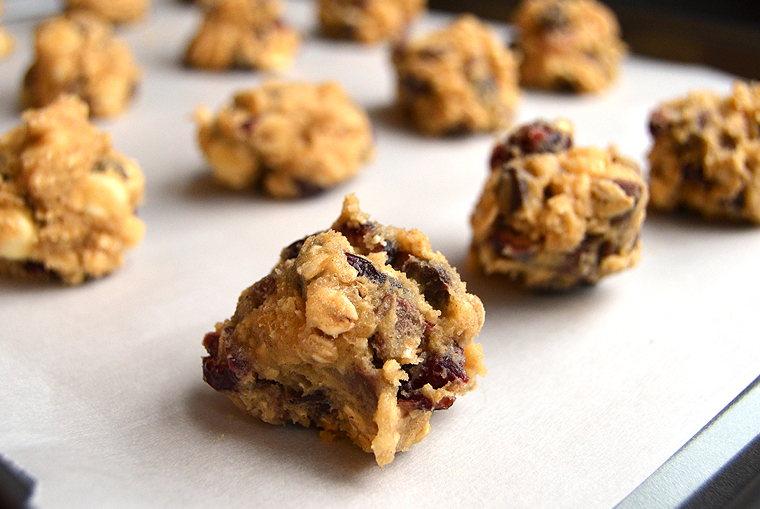 The Triple-Chocolate Cranberry Oatmeal cookies are my new favorite which was a surprise to me as I’m not as much into cookies as I once was, but these are wonderful. The Peanut Butter Incredibles remind me of those my grandma used to make, and their flavor takes me right back to her kitchen. If you have trouble deciding, I would suggest making both as they will surely be a hit this holiday season. Preheat oven to 350’F. Line two 17×13 inch rimmed baking sheets with parchment paper. 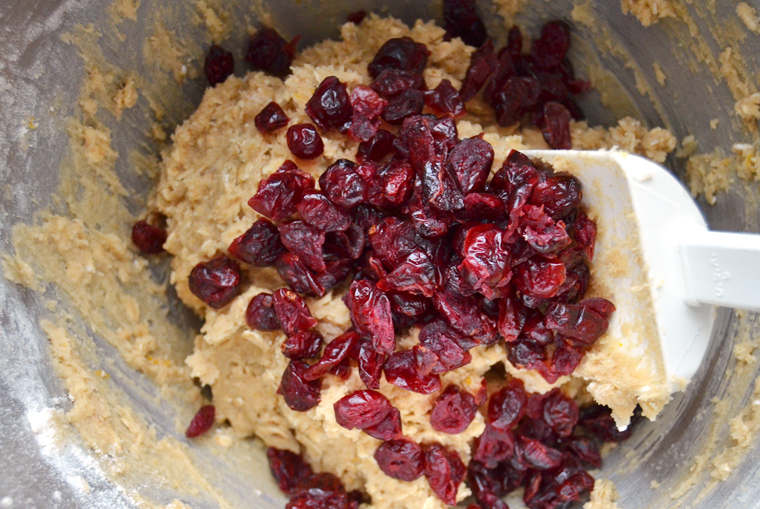 Whisk together the flour, baking soda, cinnamon, and salt in a medium bowl and set aside. In a large bowl, cream the butter with both sugars until smooth and fluffy. Add the egg, vanilla, and orange zest and mix until blended. 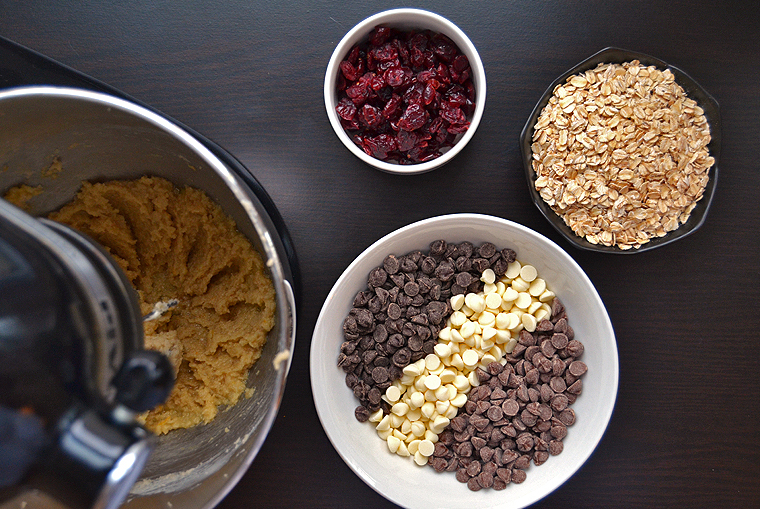 Stir in the the chocolate chunks, 1/2 cup of the milk chocolate chips, 1/2 cup of the white chocolate chips, and the dried cranberries. 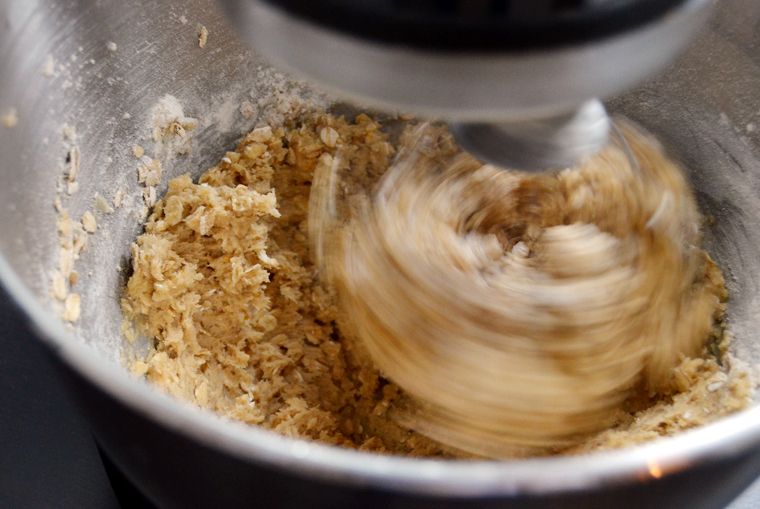 Drop a tablespoon of the batter onto the prepared baking sheets, at least 2 inches apart. Bake for 12-14 minutes, or until the edges are lightly browned. 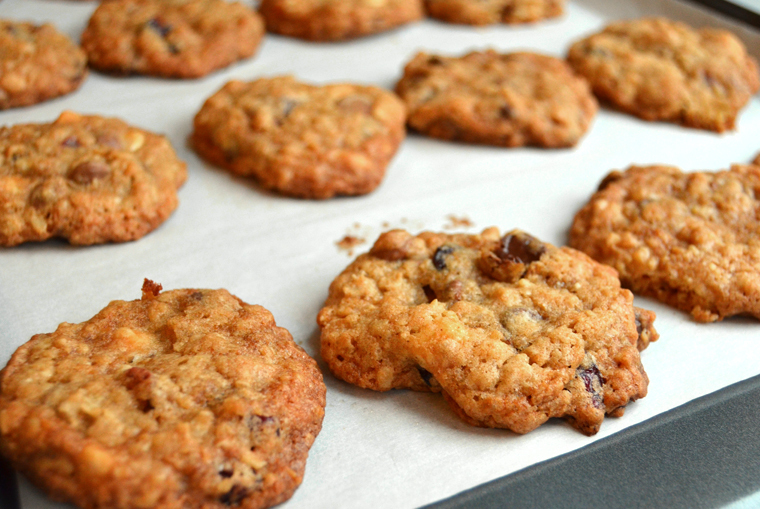 Cool on the cookie sheet for five minutes then transfer the cookies to a rack and cool completely. 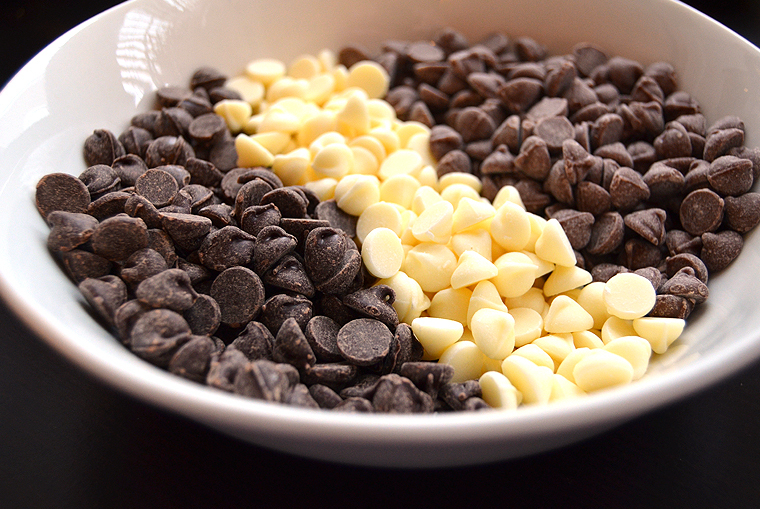 In separate small bowls, microwave the remaining 1/2 cup milk chocolate chips and 1/2 cup white chocolate chips on high power for 1 minute, sirring after 30 seconds. 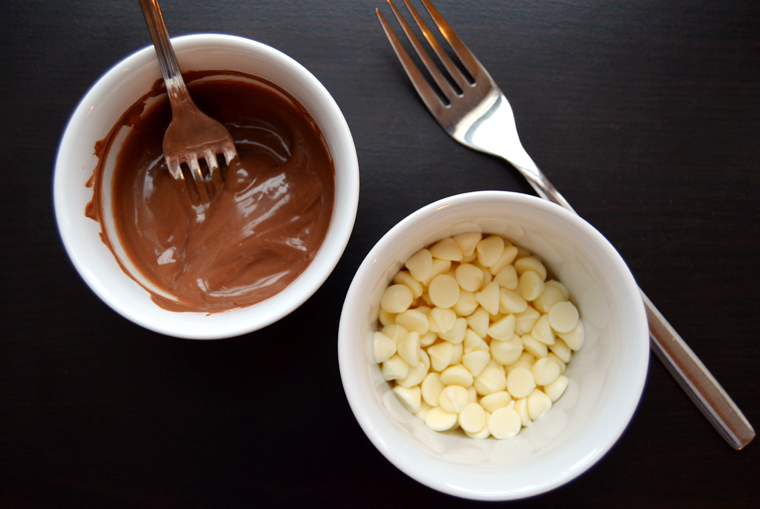 Using a small spoon, drizzle the melted chocolates over the cookies. Let the cookies stand until the chocolate sets, about 1 hour. 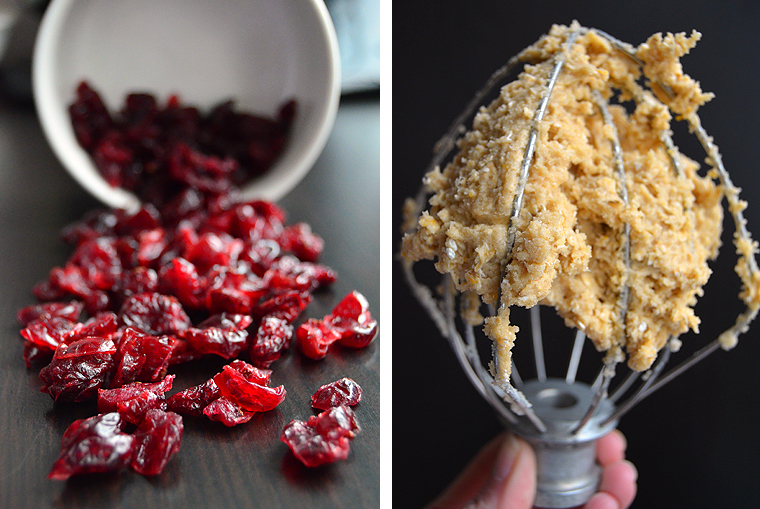 This recipe can be made up to two days ahead. Store in an airtight container at room temperature. Melt the butter in a medium saucepan over low heat. Stir in the peanut butter until smooth. Add the sugar, then the graham crackers crumbs, and stir well until blended. 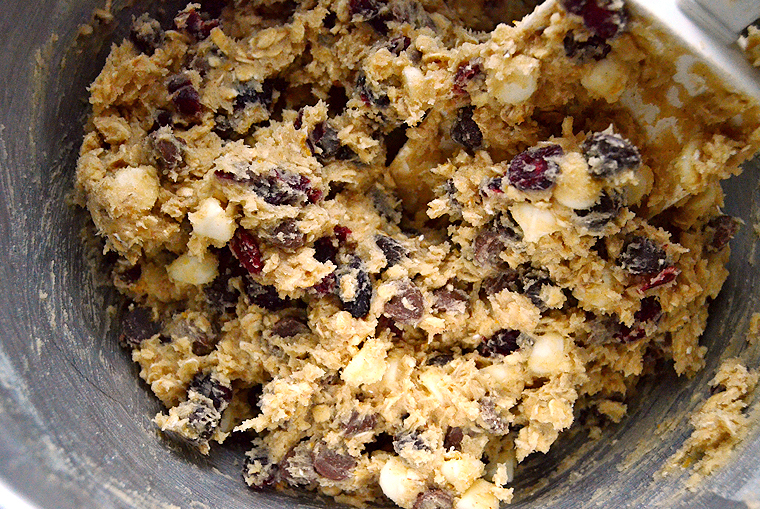 Press the mixture into the prepared baking dish. Melt the chocolate and butterscotch chips in a bowl in the microwave on high in 30-second increments, stirring each time until chocolate-butterscotch mixture is melted and smooth. 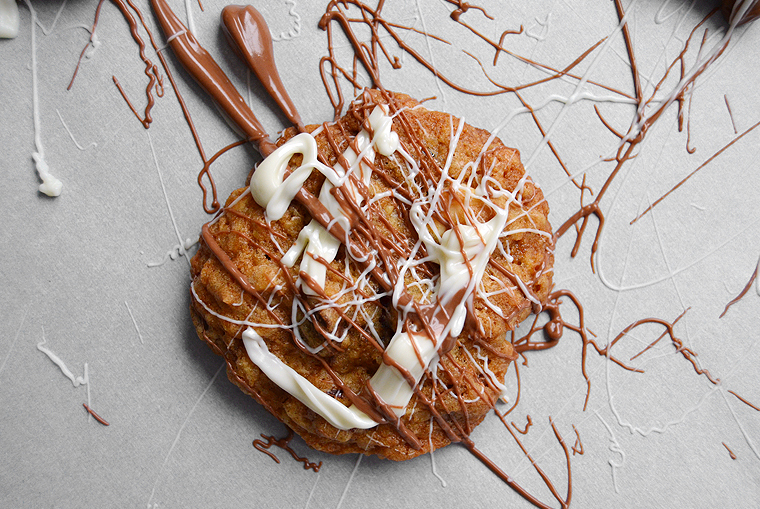 Pour the melted chocolate over the crumb peanut butter mixture and spread evenly. 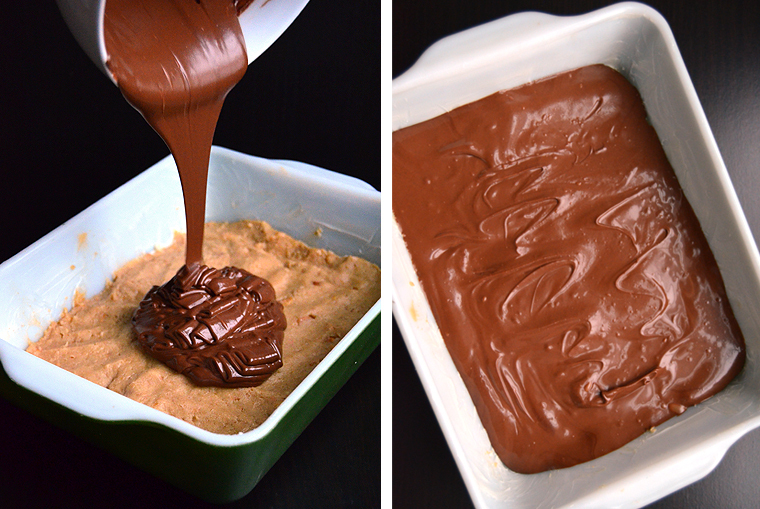 Refrigerate until the topping has set. 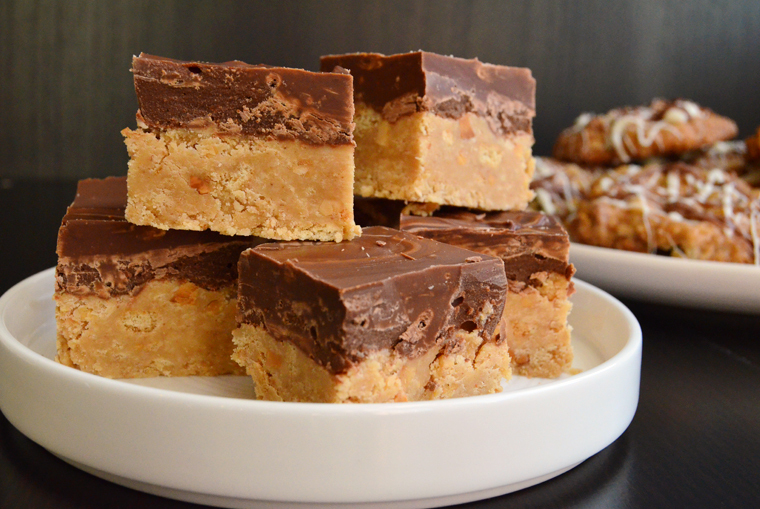 Slice into bars and store at room temperature. 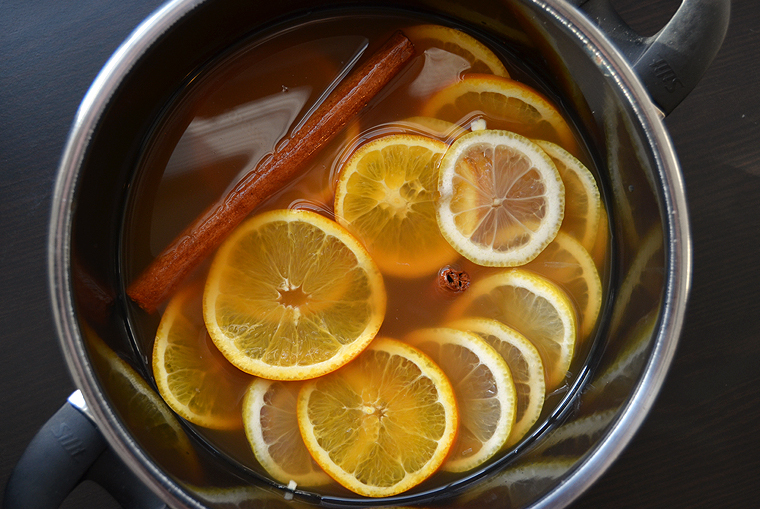 Bring the cider to a boil in a large pot over high heat, add the orange and lemon slices, cinnamon sticks, cloves and allspice, then reduce the heat to low and simmer for 30 minutes. Strain the cider and keep it warm. Add rum to taste, if desired. 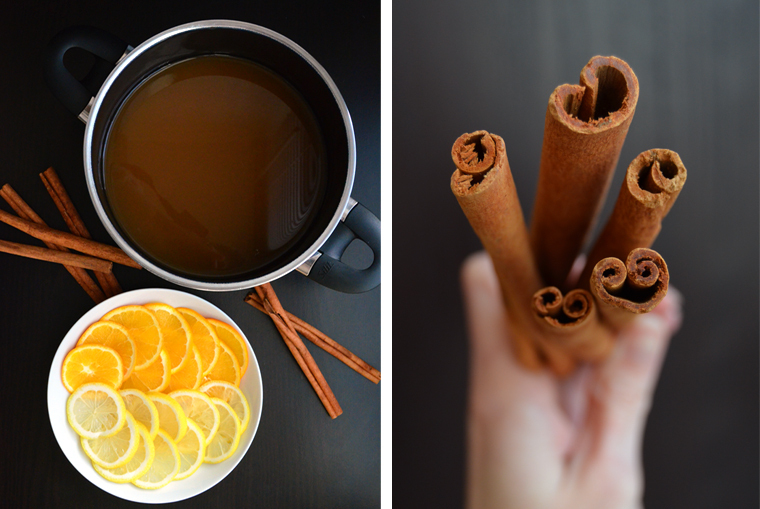 Optionally, add a cinnamon stick to each mug before serving. Note: If you don’t have all the spices in your pantry or simply to make your party prep easier, look for packets of mulling spices at the grocery store and follow the instructions on the package. This entry was posted in Recipes and tagged Around the Table Cookbook, Chocolate chip cookie recipe, Christmas, Christmas desserts, Christmas menu, Cookie recipe, Dried cranberry oatmeal cookie recipe, Entertaining cookbook, Entertaining menus, Holiday entertaining menu, Holiday menu, Holiday recipes, Kansas, Martina McBride, Martina McBride Around the Table cookbook, Martina McBride country music singer, Martina McBride new cookbook, Mulled Cider, Mulled cider recipe, Mulled Cider with Brandy recipe, Nashville, Peanut butter fudge, Peanut butter fudge recipe, Peanut Butter incredibles recipe, White chocolate cookie recipe. Bookmark the permalink.